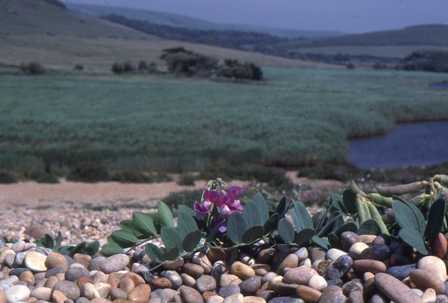 The Sea Pea grows only on sand and shingle in coastal areas. It is a low-growing, mat-forming plant with purple flowers that gradually turn blue as they age. The leaves are fleshy and the plant has an overall bluish-green appearance. 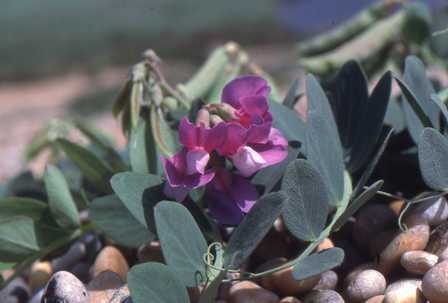 Sea Pea is a member of the family Fabaceae, but unlike many other members of this family it is becoming increasingly rare, now being mainly restricted to the south and east of England although there are various initiatives to reintroduce it to other parts of the UK where it was once common. It was first recorded in 1570 and was once so abundant on beaches that it was harvested by the inhabitants of Aldeburgh in Suffolk in times of famine. The pods of the plant are brown and grow up to 5cm in length. Sea Pea blooms from June to August.